The last few weeks I have been thinking of some of the important aspects of our Aikido training and how to share these with my students. Two of the important words I though of that I try to add to my own Aikido when I train was the concept of Kihaku and Zanshin. Below are some definitions of these Japanese words/concepts and some ideas I have to use these in Aikido. These definitions come from a Kendo manual, but I believe these can be directly related to our Aikido training. Def: The strength of spirit to face any situation. Also called ki-gai. A strong mind capable of responding properly to a pressing matter or an attacking opponent. – I think this is an essential component to our daily training. I see a lot of times people always take the relaxed approach to training. Don’t get me wrong that we should practice the softer side of Aikido. Along with that we should always be training on using less muscle and more use our opponents energy along with our hip and blending power to thrown them. However, when we train we should use our full spirit and focus in our training. This focus keeps our techniques clean and strong, and also this focus keeps us from relaxing too much. When we relax to much and don’t focus on keeping our selves and our partners safe we leave our self open for potential injury. Def: The body posture and state of mind in which, even after striking one is alert and ready to respond instantly to any counterattack by the opponent. Generally speaking, after striking one should put the proper distance between one’s self and the opponent and face him/her in chu-dan posture in order to be ready for a possible counter attack. If one cannot move the proper distance from the opponent, one should put the tip of one’s shinai in the center or around the throat of the opponent to guard against counterattack… Zan-shin is the state in which, after striking with full power and without hesitation, one faces the opponent with full spirit and with the ability to respond naturally. – I talk about using zanshin in all of our Aikido techniques. Our mental and physical energy should be focused throughout the technique until the end and after. We see this a lot where the Aikido student goes through the technique with intent, but as soon as the person is falling down you can see slack in their bodies and mind. This is easy to see in peoples Aikdio, and can be worked on each and every technique. 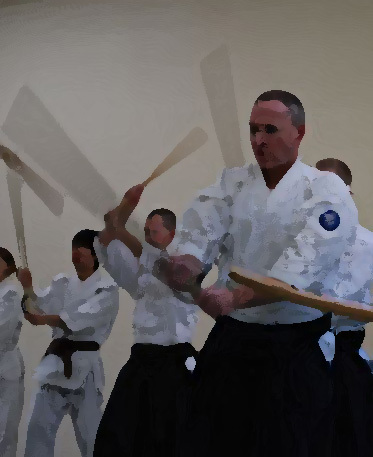 We use this practice a lot in our Aikido weapons where we employ the technique and pause at the end of the movement focusing our mind and out bodies to finish the technique out strong. I really believe that both of these concepts can strengthen our Aikido and build our spirit. There is a lot to learn from Aikido along with our techniques that we can blend into our daily lives and how we face challenges that we face every day. How are some ways that you practice or express these concepts in your training?